William A. Conti attended local schools and received a B.A. from Boston College in 1970 and his Juris Doctor in 1973 from Boston College. 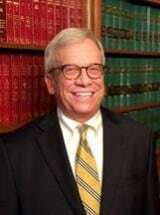 He was admitted to the Connecticut Bar in 1973, to the Massachusetts Bar in 1974, and is also admitted to practice before the United States District Court and the United States Supreme Court. Attorney Conti is a member of the American Bar Association, the Connecticut Bar Association, the Litchfield County Bar Association (Past President), The American Association for Justice, The Connecticut Criminal Defense Lawyers Association, The National Association of Criminal Defense Lawyers and the Connecticut Bar Foundation - James W. Fellows Program. He is a member of numerous local civic and fraternal organizations including, but not limited to, Past President of the Torrington Chapter of UNICO, Past Co-Chairman of the Charter Revision Commission of the City of Torrington, Past Chairman of the Civil Service Commission of Torrington, Past Chairman of the Building and Renovation Committee for the Torrington High School, and is past Chairman of the Litchfield Democratic Town Committee. Attorney Conti has practiced law for 46 years. His areas of practice include Criminal Law, Worker's Compensation, Personal Injury Law, Civil Litigation, Residential and Commercial Real Estate Transactions, and Juvenile and School Law. He has successfully argued before the Connecticut Supreme Court and the Appellate Court of the State of Connecticut. For many years, Attorney Conti was the Court Advocate (Prosecutor) in Juvenile Court and has practiced in every county in the State of Connecticut in a variety of criminal matters including, but not limited to, DWI, sexual assaults, assaults, burglaries and larcenies, murder, domestic disputes and drug offenses. It has always been his philosophy to deal with the whole person in an attempt to return a person to a normal life and to deal with clients struggling with substance and emotional issues. The power of the government is impressive, and the representation of the accused by an experienced attorney is crucial in protecting an individual's Constitutional rights and maintaining his or her presumption of innocence. Representation of individuals in Personal Injury and Worker's Compensation cases is one of the most rewarding, if not difficult areas of law. It requires patience, experience and an understanding of the client's personality, family and financial circumstances, as well as the injuries involved. In these troubled times, it is especially important to have a seasoned advocate to represent the client against insurance companies unwilling to fairly compensate victims of negligence and workplace injuries. 30% General Practice - Litigation, Real Estate, Etc.